report Kathleen Joyce and Lucia I. Suarez Sang on Fox News. 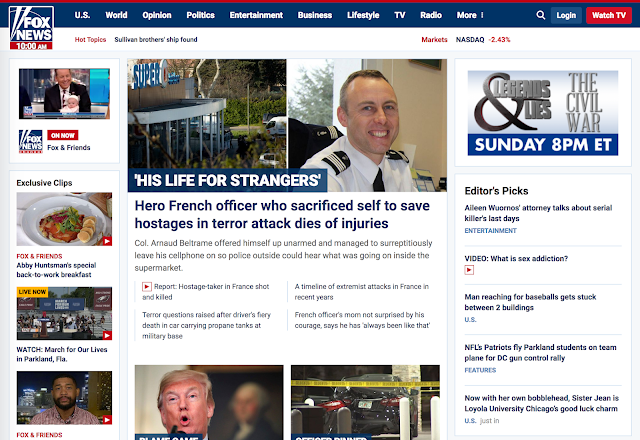 Details about the death of the officer, identified as Col. Arnaud Beltrame, were not immediately available. The officer had offered himself up unarmed to the 25-year-old attacker in exchange for a female hostage. He managed to surreptitiously leave his cellphone on so that police outside could hear what was going on inside the supermarket. Beltrame was grievously injured, and his death raised the toll from the attack to four. Police said the suspect, identified as Redouane Lakdim, 26, carjacked a vehicle, shot at police and barricaded himself inside a Super U supermarket in Trebes before officers stormed in, fatally shooting him. The mother of a French police officer who was killed after he swapped himself for a hostage during an Islamic extremist attack on a supermarket says that she wasn't surprised by her son's courage. "I'm not surprised. I knew it had to be him. He has always been like that. It's someone, since he was born, who gives everything for his homeland." Asked if she was proud of him, she said he would have told her "'I'm doing my job mom, that's all.'" She said to "defend the homeland" was his "reason for living." According to a story in Thursday’s Times, a handbook has at last been published offering judges “advice in how to avoid giving offence”. … Thank heavens. We live in better and more enlightened times. Overt racism and sexism are not tolerated anywhere, by anyone. Except in the White House, of course. So what the Judicial College is looking to stamp out now, as the noose tightens around those who would seek to upset their fellow humans with outrageous prejudice, are words like “Afro-Caribbean” (which I didn’t know was actively offensive but is a mouthful and I’d never say it anyway), “transsexual” (which I assumed was fine but should apparently be “trans person”), “ethnic minority” (which I truly thought was just a description of when one ethnic group is outnumbered by another), and “postman”, which is obviously downright bloody disgusting fascist language and must be stamped out now, or we will soon be in a situation like Germany in 1933, with postmen first being denied marriage licences and council flats, then being hounded into special “postie” ghettos, then “relocated in the East” and ultimately marched to their deaths in the gas chambers of Poland — all of which, the Equal Treatment Bench Book asserts, can be avoided by merely calling them “postal operatives” instead. So a big “phew” for that. And speaking of gas chambers, they are also looking to stamp out the word “Jew” on account of its “potentially negative connotations”. So does that mean I am not one any more? I mean, it’s great that judges are being told not to chase me down the street throwing rashers of bacon at me, shouting “Jew! Jew! Jew!”, because frankly I have had enough of that, but if it’s at the expense of my using the only word I can think of to describe my racial identity then maybe I’m not such a big winner after all. And “Jew” is my racial identity only, by the way. I do not practise. I am a “Jew” only in the way that a black person is black. Although with more counting money and less dancing. Is that racist? Yes. But only because I said “Jew”, according to the handbook. What I should have said was “Jewish person”. Because that is MASSIVELY different. It’s like when Benedict Cumberbatch got hauled up (rightly) for saying “coloured actors” and we suddenly learnt that “person of colour” was a thing. So white columnists all started writing “person of colour” everywhere to show how liberal they were, until Twitter exploded with pissed-off black people, shouting, “I’m not a person of colour! I am a black woman!” And damn right. Because euphemism is the worst thing of all. It compels people to apologise linguistically for being who they are. The political correctness movement did a wonderful thing from the mid-1980s onwards to change the language used about groups who had suffered years of bigotry. But changing the focus of language did not reduce the sum total of hate. You can’t do that. Telling a blind person — as the handbook recommends — that she is “a person with sensory impairment” does not give her back her sight. … In ten years on social media, nobody has ever called me a y**. Or even a Jewish person. But every time I write something that the millennials don’t like, they pour forth a stream of personal abuse centred around such new disentitlements as being “privileged”, “cis male”, “Oxbridge” and “public school”, all of them accidents of birth which my abusers believe should disqualify me from work in the media. When I write something angry they ask, “U okay hon?” which, in case you didn’t know, is the modern way of suggesting that a person is experiencing mental health issues. It is exactly the same as calling someone with depression a “spastic in the head”. It’s just new words for an old thing. No less hate. So I’m going to say to the judges: burn your stupid handbooks (although not in a Nazi way) and just show respect for your fellow humans. And if that leads to a Holocaust of the postmen, well . . . my bad. 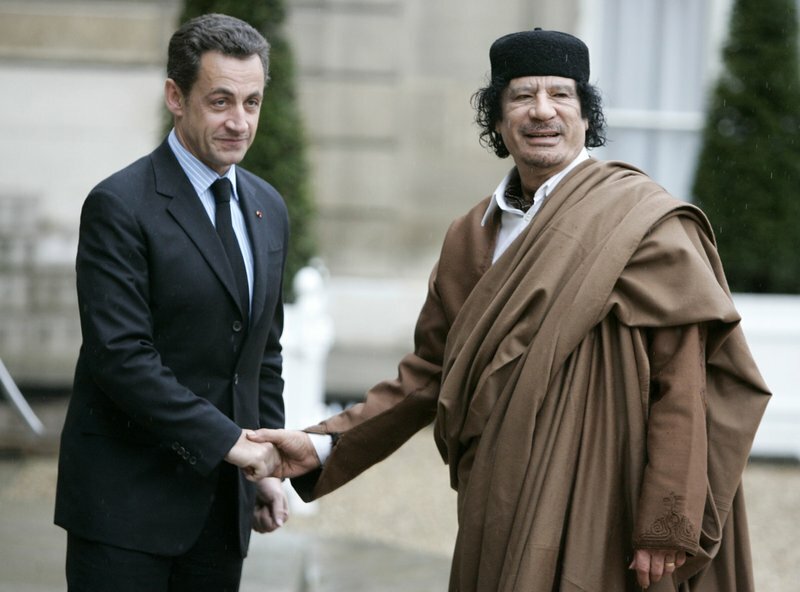 Sarkozy Accused of Accepting Millions of Euros from Libya for His 2007 Campaign; Did Gadhafi and Other Africans Also Fill Obama's Coffers in the 2008 Elections? No Pasarán has reported on this before — and on something far worse (see below) — and tried to bring it to the attention of American conservatives. Back in 2011, Instapundit quoted Foreign Policy's Joshua Keating as reporting on the Qaddafi régime's response to the French government's recognition of Libya's rebel forces, through Colonel Kaddhafi's son. France ain't alone and Sarkozy's winning 2007 presidential campaign may hardly be the only one. Time to head West, over the Atlantic. Is it possible that Obama's reluctance to interfere in the Libyan crisis has something to do with secrets? There are elections in America now. Along came a black citizen of Kenyan African origins, a Muslim, who had studied in an Islamic school in Indonesia. His name is Obama. All the people in the Arab and Islamic world and in Africa applauded this man. They welcomed him and prayed for him and for his success, and they may have even been involved in legitimate contribution campaigns to enable him to win the American presidency. Europe is being battered by unusually frigid conditions even as temperatures at the North Pole soar well above normal. 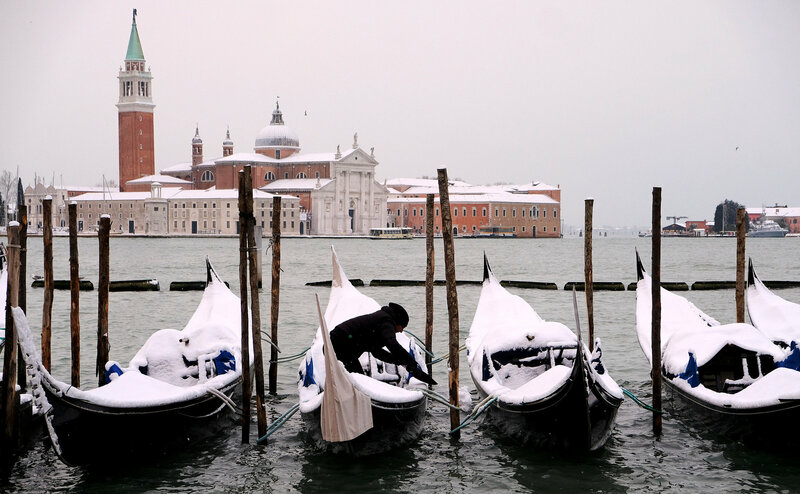 As the month of March 2018 started, Kendra Pierre-Louis reported that Europe was colder than the North Pole. So, naturally, with all the hoopla around global warming for the past few decades, her New York Times article could not only report on the (climate) news, it also had to explain how on Earth (yes, that's also meant literally) this could be the case. [Update: thanks to Ed Driscoll for the Instalink.] In the process, Kendra Pierre-Louis managed to repeat myths such as the one that "human-caused climate change … is agreed upon by 97 percent of climate scientists." Subfreezing temperatures have spread across much of Europe over the past week, stretching from Poland to Spain. Snow fell in Rome for the first time in six years. Norway recorded the lowest temperatures of the cold snap: minus 43 degrees Fahrenheit (minus 42 Celsius) in the southeast part of the country on Thursday [March 1]. 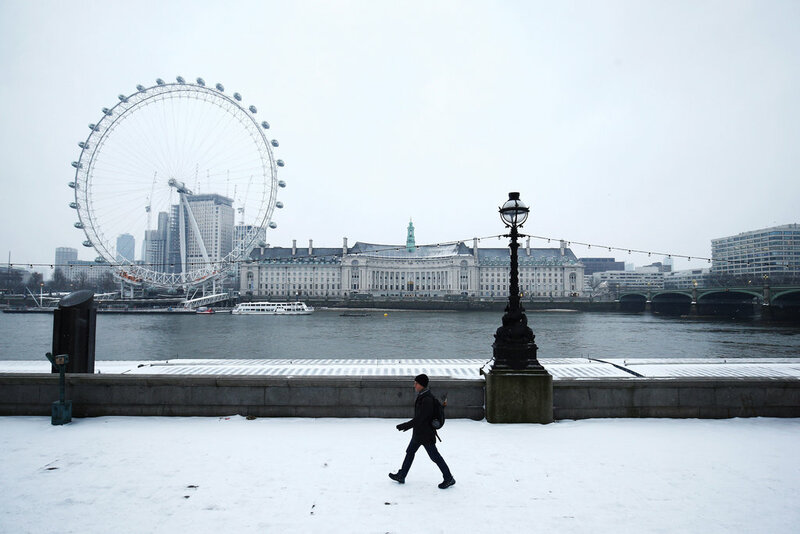 And on Friday [March 2], Britain and Ireland were buffeted by a storm that brought snow and high winds, along with cold that was expected to linger for days. If Europe feels like the Arctic right now, the Arctic itself is balmy by comparison. The North Pole is above the freezing mark in the dead of winter; there are no direct measurements there, but merging satellite data with other temperature data shows that temperatures soared this week to 35 degrees Fahrenheit (2 degrees Celsius). That is 50 degrees Fahrenheit above normal, and 78 degrees warmer than in parts of Norway. The Arctic warmth and the European cold snap have raised questions over whether the unusual weather occurrences are linked to each other, and if they are somehow related to climate change. Here are some answers. Are the Arctic and European weather patterns connected? Probably, according to Judah Cohen, a climatologist who is director of seasonal forecasting at Atmospheric and Environmental Research, a weather risk assessment firm. Dr. Cohen is the author of a 2017 study that linked a warming Arctic to the intermittent blasts of cold that those of us in the Northern Hemisphere have come to know as the polar vortex. When it behaves normally, the polar vortex helps trap cold air in the Arctic. “It’s locking in that cold air at the high latitudes in the Arctic region,” Dr. Cohen said, comparing the polar vortex to a dam holding back the frigid arctic air from the rest of the Northern Hemisphere. But sometimes that dam bursts as the polar vortex weakens and allows cold air to escape the Arctic to more temperate climes. This has always happened from time to time, but a growing body of research suggests that because of climate change the warming Arctic is weakening the polar vortex. Why is the polar vortex weakening? Researchers are still figuring out how the warming Arctic is triggering the polar vortex’s aberrant behavior. Some of them, including Dr. Cohen, point to melting sea ice, caused by global warming. Dr. Cohen says the loss of ice creates patterns of high pressure near the Barents Sea and Kara Sea off northern Russia. That high pressure blocks the low-pressure system of the polar vortex, weakening it in the process. There is not yet a scientific consensus over the root cause of the weakening polar vortex; it’s fair to say that it is not as definitive as, say, the evidence for human-caused climate change, which is agreed upon by 97 percent of climate scientists. But it’s worth noting that in January the extent of Arctic sea ice was the lowest ever recorded for the first month of the year. In some parts of the Arctic the sea ice is already breaking up before winter’s end. And Arctic sea ice has been declining since at least the late 1970s. What happens when the polar vortex weakens? When the polar vortex weakens it allows cold air to escape and head south. This is what Dr. Cohen suspects happened in late December and early January when the Northeast United States endured some of its coldest temperatures on record. Other researchers who conducted a rapid analysis of the weather event aren’t so sure, though they stress theirs is just a first pass at the data. … meanwhile, some countries like Spain that are wholly unused to the cold are freezing. That explains why Europe is freezing, but why is the Arctic so warm right now? Dr. Cohen likens the Arctic to the refrigerator in your kitchen. When the refrigerator door is closed, the fridge stays cold and the kitchen stays warm, but if you leave the fridge door open all the cold air comes out. Because air is spilling out of the fridge, it has to be replaced by surrounding air — air also has to flow into the fridge, or in this case the Arctic. And since the air outside the Arctic is warmer, it will necessarily move in. 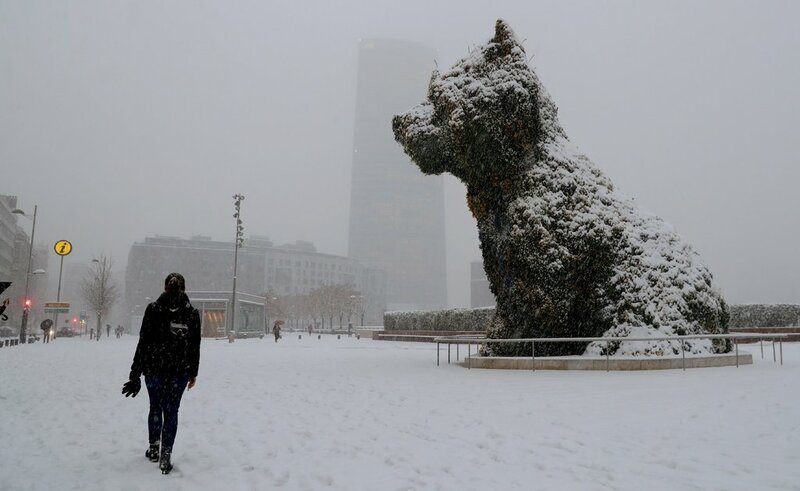 For the first time in over 30 years, reports Géo, Corsica's capital is covered with snow. Those explanations are all good'n'well, but as a Prager U video reveals, the New York Times is repeating a myth ("human-caused climate change … is agreed upon by 97 percent of climate scientists") that, according to Alex Epstein, Director of the Center for Industrial Progress and author of The Moral Case for Fossil Fuels, has a shady source, is a manipulative scare tactic disguised as scientific claim, and should never be used by anyone with intellectual honesty.